Anyone notice he has a lisp? "my shield for arguth"
Since you can't really see what this guy has in his right hand, I like to imagine that he's dual-wielding shields. Yup, this along with Knife Juggler was some of my most well-spent dust. I used to max him in every deck. took me so long to start letting go of this card. it's really fantastic. BUT does the gold one make the hommies on the side turn gold? I doubt it but that would be pretty sweet. I love this card. I'm just wondering why it is not used more in class like priests who would run a deck with sticky minions. because a 10 health minion and a 11 health minion are almost equally sticky, either require hard removal. It also puts more eggs in one basket, which is something priests already tend to do. as for taunt, priests already have 2 dragon taunts. Priest doesn't have to play only dragons deck... Plus the two dragons taunt are common. Wyrmrest Agent is not a dragon. this card is nasty when you can use him with those Giants. Really depends on what you want to play. This fits into many decks and especially is popular with warlock, shaman and pala currently. I've been playing for a while, but somehow never got this guy in a pack. Have almost all other rares and preferred saving dust for epics and legendaries. Finally gave up and crafted two last week. 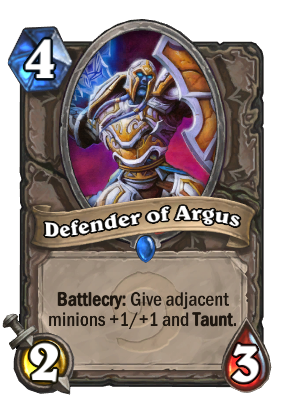 Of course the very next pack had a Defender of Argus. LOL, this is the same reason why I'm hesitant to craft an Unstable Portal. I think it´s a good but also a fair card. To provide as much value as a yeti you need to have 2 other creatures on board and you need to take care of the placement. If you have for example a flametongue totem and two adjacent creatures its not so easy to place him effectively. But the good part about him that many people forget about is the immediate effect on the board. You might attack for 2 more dmg right away or trade favorably. It might be seen as 2x1 dmg by a charge creature. One of the strongest neutral rares around, fits into a great amount of decks with its utility. on top of that the taunt can save your life , or draw out early cc, for anyone starting up hearthstone this should be one of your first crafts as it is cheap and super efficient while also teaching players that positioning your cards on the board matters. A 2/3 for 4? Weak. Giving 2 other minions +1/+1 and turning trades into advantageous attacks? Brutally strong. This card is much better than its attack and health would dictate.